View all my guitar lessons here. Want private lessons over Skype? Click here to learn more. In this video lesson you’ll learn the four basic barre chord shapes and how to use them to create major and minor chords all over the fretboard. Barre chords are created by using one finger to press down some or all of the strings. Typically, you use your index (1) finger to press down all the strings and then form chords underneath. 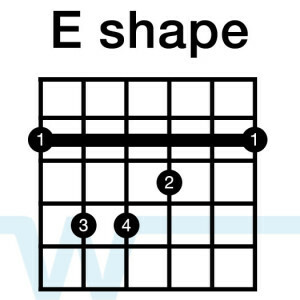 There are four basic shapes that you can use to form any basic major or minor chord. The four shapes are E, E minor, A, and A minor. They are just what they sound like – form an E, Em, A, or Am shape underneath the barre that you make with your index finger. You then move them up and down the fretboard to form the chord you want. 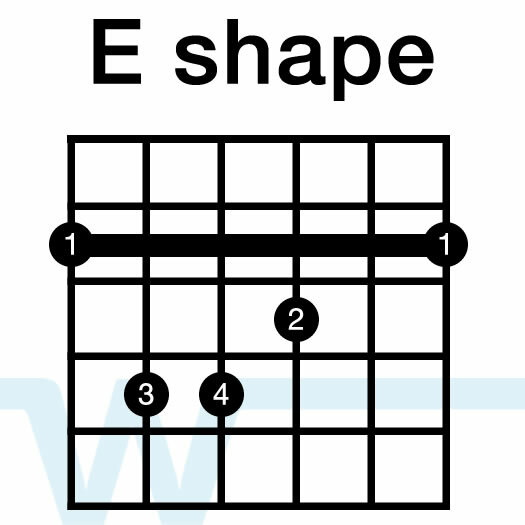 The chords you create with this shape are the same as the E major shape, except they are all minor chords instead of major chords (reference the chord list above). 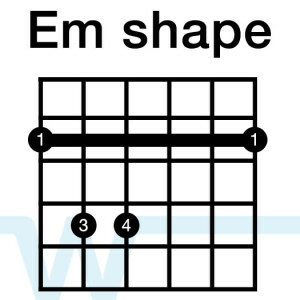 For example, if you use the Em shape on the with your index finger on the 10th fret, you are playing a D minor. 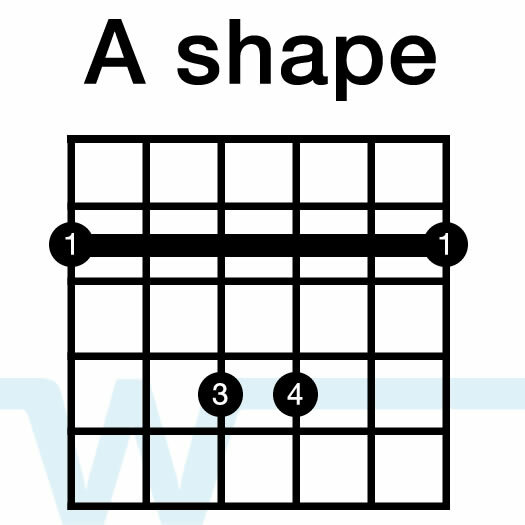 The chords you create with this shape are the same as the A major shape, except they are all minor chords instead of major chords (reference the chord list above). 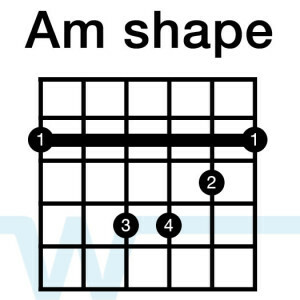 For example, if you use the Am shape on the with your index finger on the 10th fret, you are playing a G minor. 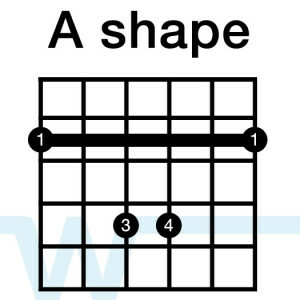 You can usually form any basic chord using either of the shapes. 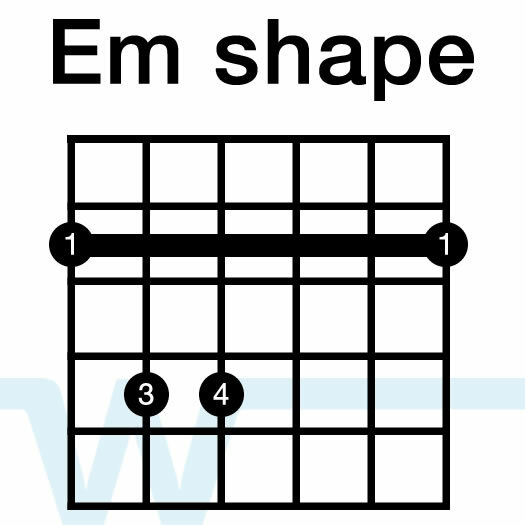 Notice that you can play a G major chord by using the E major shape on the 3rd fret or the A major chord on the 10th fret. This is awesome, I had such a hard time learning barre chords until now! Thank you so much! Thanks! I’ve never really used a slide before, but using it as a bar (like your finger would be) is basically how they work – give it a shot! I am a beginner and have started trying barre chords. I am having real problems getting my fingers into position while holding the barre. For example, I can’t play a B using a barre. My fingers just don’t go where they need to. Do I play other variants of the chord or does the flexibility improve somehow. If it is a flexibility thing, then what should I be doing. Hi Stuart – the best advice I can think of is just to keep practicing. I remember a point with barre chords when it all just seemed to click and I could finally do it. Building strength is a big part of it, and that just takes time. Ohhhh, I’m really excited for this lesson. 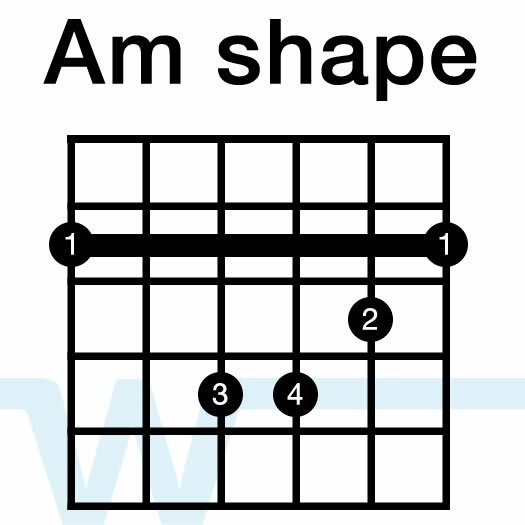 I’ve been trying and gambling over this barre chord….but now I’m Free bcs I practise them once and got it once…..
Hi Tim – for any of these songs you can play barre chord version of the chords rather than open chords. Typically, though – on acoustic open chords are much easier to play and they sound better. Wow, thanks a lot for this Brian! I’m a beginner with the guitar and your videos are really helpful. I love learning the mechanics of how things work and your explanation cleared up a whole lot for me. Thanks again! !